Kites are fun, and so should math be. Step outside the math box of rote learning and worksheets, then make and fly a kite! Grocery bag kites are easy to create and fun to fly. 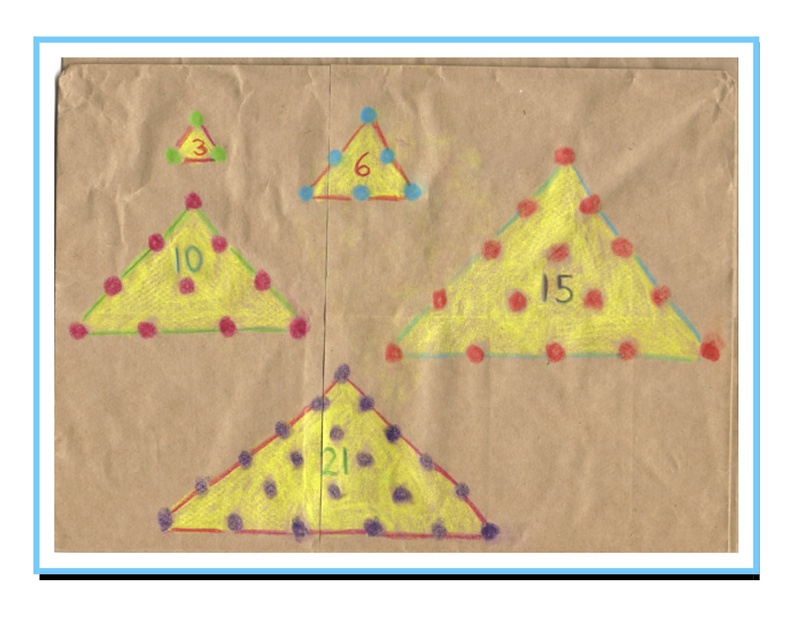 Have your child(ren) decorate their kites with whatever wonderfully colorful math patterns they’re learning at the moment. The brown paper is a good surface for bright, chunky colored pencils (the color can easily be removed or changed with an ink eraser). 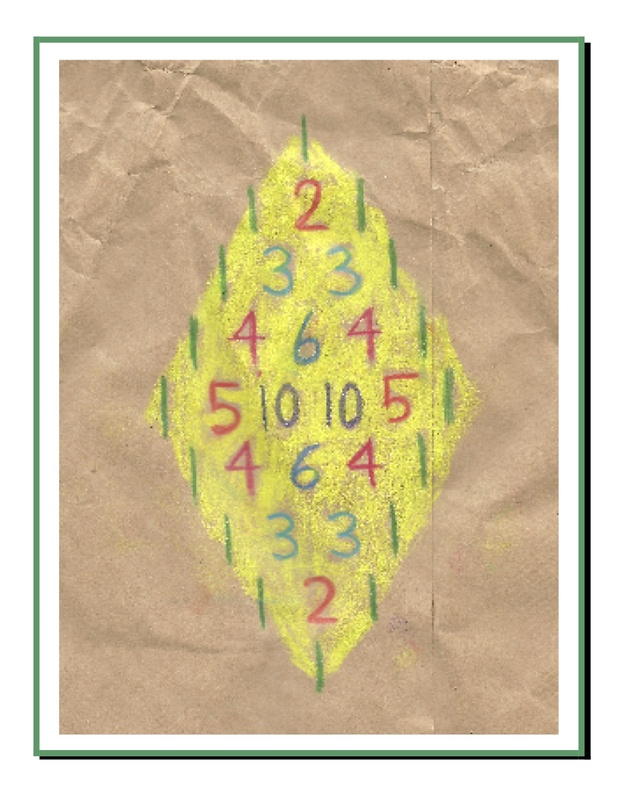 And here are the first 5 triangular numbers, 3, 6, 10, 15, and 21. The 2’s: start at 0 then proceed to the right: 2-4-6-8-10. The 8’s: start at 0 then proceed to the left: 8-16-24-32-40. The 4’s: start at 0 then proceed to the right: 4-8-12-16-20. The 6’s: start at 0 then proceed to the left: 6-12-18-24-30. The bottom image is diamond square numbers for 4, 9, and 16. If you count the rows of dots, you have the odd numbers: 1-3-5-7. You can go on building these diamond shaped rows to access all of the square numbers. Try it! 1) Make 4 holes in the top of the bag, one at each corner. Add the paper ring reinforcements to each of the holes (one on each side) to ensure that the holes don’t tear through. 2) Cut 2 lengths of string, about 30” each. 3) Tie each end of the strings through a hole in the bag, making 2 loops. 4) Cut another piece of string, again about 30” and tie one end around the middle of the 2 loops and tie a knot. This is the “flying” string or handle. 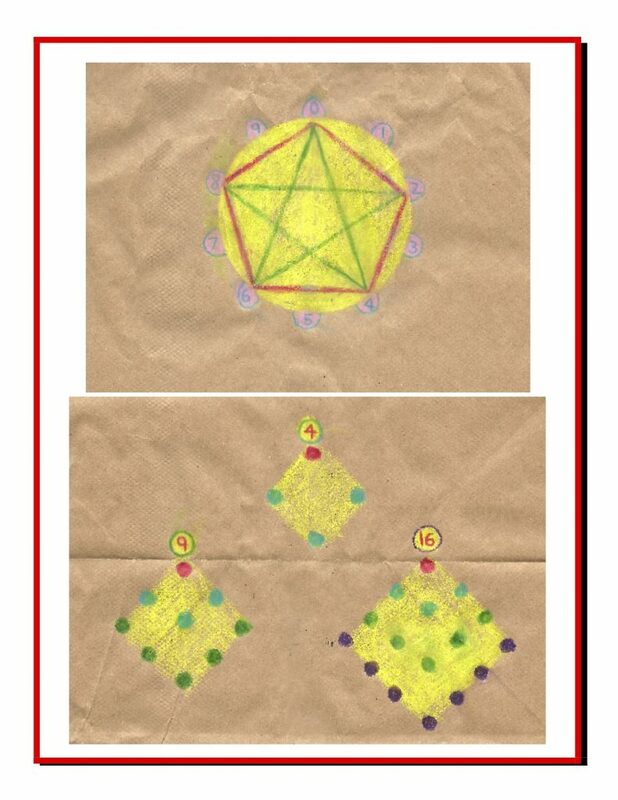 5) Decorate with colorful math patterns! 6) Cut the crepe paper into strips for the streamers or kite tails, and glue them to the open end of the bag around the strings you attached earlier. 7) When the glue is dry, the kite can fly. Hold tightly to the string handle and run so the wind catches the kite. When the bag fills with air it will float and flutter behind you. Add more string to the handle to fly the kite higher.